SEOUL, May 27, 2018 (BSS/AFP) - North Korea on Sunday said its leader Kim Jong Un was "fixed" on holding a summit with US President Donald Trump, raising hopes the historic meeting might still take place after a turbulent few days of diplomatic brinkmanship. The latest conciliatory declaration from Pyongyang came as the White House confirmed it was sending a team to Singapore to prepare for the June 12 summit -- a further signal that both sides were moving to cool tensions following a rollercoaster few days on the Korean Peninsula. Trump rattled the region on Thursday by cancelling his meeting with Kim, citing "open hostility" from Pyongyang. Trump's unpredictability sparked a sudden and surprise meeting on Saturday between Kim and South Korean President Moon Jae-in -- only the fourth time leaders from the two countries have ever met -- as they scrambled to get the talks back on track. Kim "expressed his fixed will on the historic DPRK-US summit talks" during the talks with Moon, the state-run KCNA news agency said in a report released Sunday, using the official abbreviation for North Korea. "Kim Jong Un told Moon Jae-in to positively cooperate with each other as ever to improve the DPRK-U.S. relations and establish mechanism for permanent and durable peace," the report added, saying South and North Korea would hold another round of "high-level" talks on June 1. The presidential Blue House in Seoul said the two sides discussed ways to improve ties "and to ensure a successful US North Korea summit", adding Moon would give an update Sunday morning. The surprise meeting came as Washington gave a strong hint the summit was back on. Trump's original decision to abandon the historic summit initially blindsided South Korea, which had been brokering a remarkable detente between Washington and Pyongyang and is desperate to avoid conflict breaking out. Moon won the election last year partly by vowing to be open to dialogue with Pyongyang and finding a solution to a Cold War-era sore that continues to blight the region. But he left the door open to future meetings, and Pyongyang responded by saying it was willing to sit down "at any time", prompting Trump to reply that the Singapore summit could still take place. Saturday's meeting between Moon and Kim took place on the North Korean side of Panmunjom, a heavily fortified village that lies between the two countries and marks the spot where the armistice ending the Korean War in 1953 was signed. 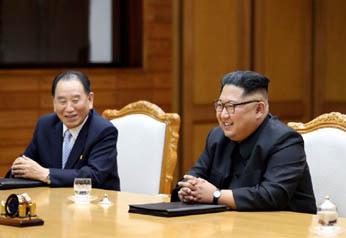 Only last month, the two leaders met in the same village, with Kim famously inviting Moon to step briefly into the North before they both held talks in a building on the South's side. "Today's summit is aimed at resolving the misunderstanding caused by communication glitches between Washington and Pyongyang and lay the groundwork for the US-North Korea summit," he told AFP. Footage released by the Blue House on Twitter, accompanied by a dramatic orchestral score, showed Moon arriving in a convoy of cars and first shaking hands with Kim's sister Kim Yo Jong, who has played a major public role in recent talks with the South.